Crafting dreams – for less! Do you dream of having your own business? Stampin’ Up! is making that opportunity available to you for only $87.50 until November 30. 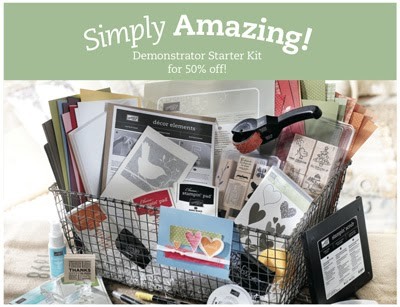 The Demonstrator Starter Kit offers over $300 worth of stampin’ goodness for you to enjoy with no strings attached. It contains all the product and business supplies you need to start your own business, or if that’s not your interest it’s just a super crafting value! Stampin’ Up! is making both the Standard and Digital Plus Starter kits available at this price. Click HERE to see a comparison of the two kits, and remember – your cost is $87.50. Need more information? Check my Online Store and investigate the Start Your Own Business button at the top RIGHT of the landing page, or leave me a comment and we can talk more. Ready to sign up today? My special password just for you is TheMauiStamper.